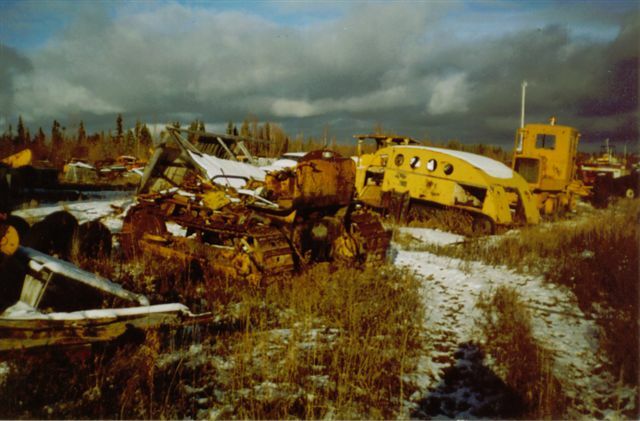 This story of the D6 9U known as ROLLER-LESS begins in Ilford, Manitoba with the KING OF OBSOLETE being given the Kip collection. When I arrived on the inspection tour in March 2003 I didn’t get to see much of the D6 9U because of all the snow. 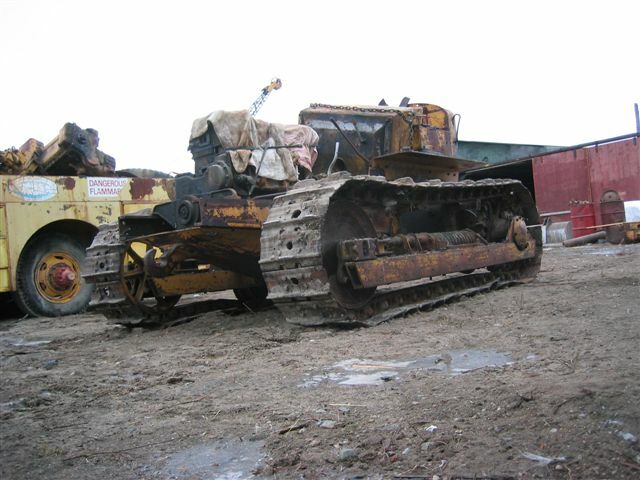 This cat was stripped right down to the tub frame and only the fuel tank and tracks are what made the frame look like a cat. The motor and transmission were in the shop but everything else was scattered around the yard like a tornado went through it. So the first thing I did when I arrived in October of 2003 was to get the yard organized for shipping all the collectables to the KINGDOM beside Lynn Lake, Manitoba. This was a feat in itself due to the fact the snows were coming and I had little time to get things ready. 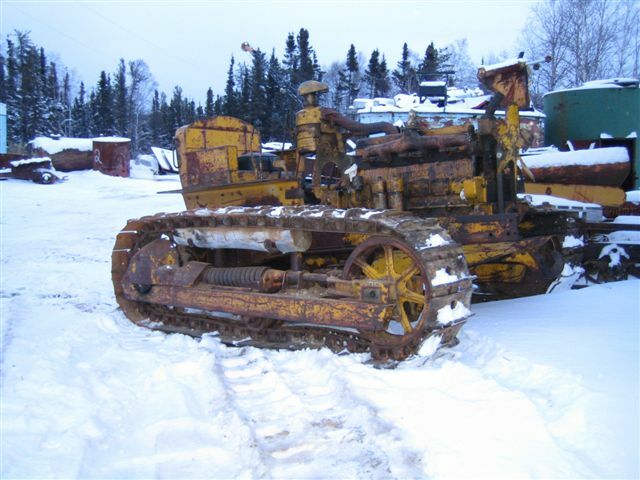 The D6 9U was placed up on railroad ties by the loading ramp for when the trucks come in on the winter road in January 2004. When I placed the D6 9U up on the rail road ties that is when I realized for the first time that this poor cat had no bottom track rollers so that is how he got the name ROLLER-LESS. In January of 2004, ROLLER-LESS almost got loaded on a semi heading to the KINGDOM. But the driver thought he would have too much weight for traveling across the frozen lakes on the winter roads out of Ilford, Mb. So poor ROLLER-LESS got to sit and wait for the next semis but there was never any room for him on any of them also. So he had to wait almost a year until I arrived to ship the scrap out of Ilford, Mb. So with the scrap all loaded on the railcars, I loaded my ford semi on a flat car and shoved ROLLER-LESS on the back of the flat car. It was tight but he fit with about an inch to spare and he was ready for the train ride of his life. Yes! A train ride of his life that that took 14 days of traveling 1500 kms before arriving in Thompson, Manitoba which should have been a 4 hour train ride completed in one day. It is hard to explain how a rail road company can take a railcar with my collectables on such a long trip. This is what was supposed to have happened. I hop the passenger train out of Ilford, Mb at 7:00 am in the morning and 4 hours later I’m in Thompson, Mb. Then the freight train comes along at noon in Ilford, Mb and picks up the railcar with my collectables and 4 hours later the railcar is to be in Thompson, Mb. I unload my semi and ROLLER-LESS by around 5:00 pm and by 7:00 pm I have my buddy Barry’s semi loaded also with collectables that were shipped down a week earlier. So by midnight we are all home in the KINGDOM, and the next morning we unload all the collectables in the KINGDOM. But when you deal with the railroad never take anything for granted. By 2:00 pm I phone Ilford, Mb to make sure that the railcar has left, but it is still there. So I phone the railroad and they tell me that the train is late and the car won’t be in Thompson, Mb until late tonight. But I have heard this story before, last time it cost me 3 nights in a hotel because the train was really late! So being smarter this year I phoned SOUTHERN BELLE and she bounces over the 300 km of so called road to pick me up and take me back to the KINGDOM. When we got home we were too tired to cuddle because it is now 2:00 am in the morning. So the next day I get up and phone the rail road to find out where the railcar is, well the train is broken and won’t make it for a couple of days. Boy I was glad I made the decision to head home to the KINGDOM instead of waiting in a hotel room, because I had been there and done that before! So after waiting for a couple days, the rail road phones and says my collectables are at the loading ramp, please unload them so another customer can load the railcar. But once again I’m smarter than that and I phone a buddy of mine in Thompson, Mb to take a drive by to see with his own eyes where this railcar is with my collectables. When my buddy phones back he is laughing his head off, because there is no railcars in the whole rail yard with my collectables, not even the other railcar that was sent a week before with the D6 9U known as THE HOOD. But I’m not laughing like my buddy so I thank him and hang up the phone in disbelief. How can a railroad lose 2 railcars of my collectables and phone me to say that the railcars are there? Now if I had headed out with my buddy Barry in his semi to go and get my collectables and found nothing, boy I would have been really mad and blown a gasket! Well 14 days after leaving Ilford, Mb all my collectables finally arrived in Thompson, Mb with a phone call to my buddy to confirm that my collectables are at the loading ramp. So my buddy Barry and I head out to get my collectables but it is in a little snow storm which turned bad. The snows kept coming and coming which made it very interesting to unload the collectables from the rail car and then try and load them on the semi for the trip to the KINGDOM. Of course I had to pay for the snow to be removed at the rail siding so the semis could move around without getting stuck. The rail road loader operator just sat in his machine watching us do his job. Oh well excellent customer service!! So after about 7 hours of fun and more fun in the deep snow, we realized that ROLLER-LESS wouldn’t fit on Barry’s semi so he got left behind in the snow at the tracks. I would be back for him in a week’s time. The fellow that was to haul him to the KINGDOM was in an accident with his semi and couldn’t do it so SOUTHERN BELLE and I headed out on a cold Saturday morning to pick ROLLER-LESS up and do a little shopping. When we return to the KINGDOM that night with ROLLER-LESS it was only -48C out so it would be a couple of days until it warmed up enough to unload ROLLER-LESS. Now ROLLER-LESS sits in a shed waiting for his turn in the little shop so he can go back to being a winter freighter. 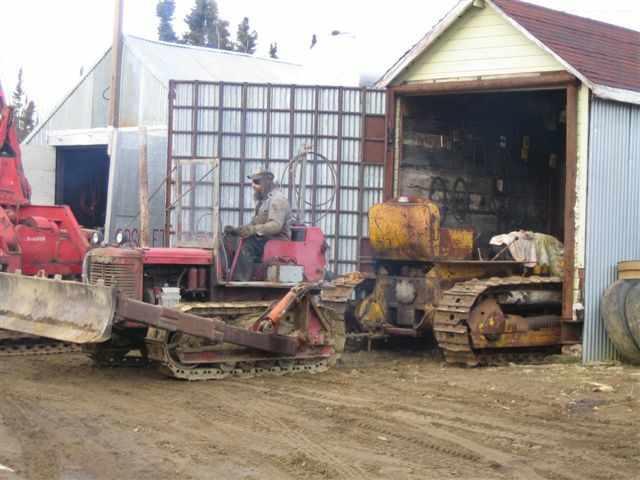 AT THE END OF OCTOBER 2005 I GOT BUSY ON "ROLLER-LESS" AND USED THE TD-6 KNOWN AS "CURSE OF REVERSE" TO DRAG HIM OUT OF THE SHED WHERE HE SPENT THE SUMMER. 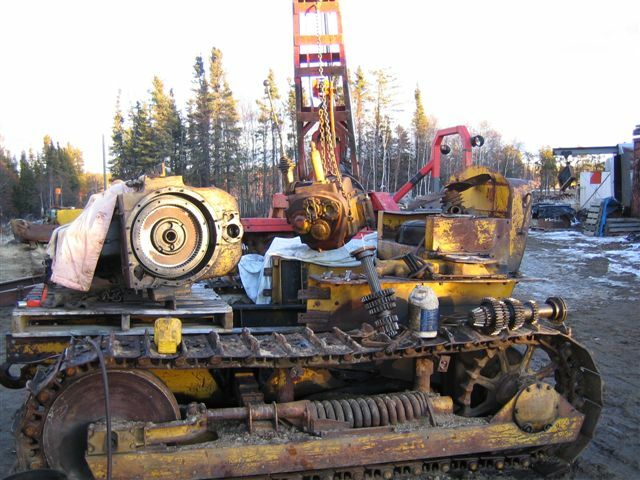 WITH THE USE OF THE RED CRANE CAT I REMOVED THE MOTOR AND FIXED THE 12" HOLE IN THE SIDE OF THE TRANS. THE WEATHER HELD OUT FOR ME TO GET THE MOTOR AND TRANS BACK IN THE CAT SO IT COULD GO IN THE SHOP FOR MORE WORK. AFTER A MONTH IN THE LITTLE SHOP, I WENT AS FAR AS I COULD GO WITH OUT SPENDING A LOT OF MONEY WHICH I DON'T HAVE RIGHT NOW WITH SOUTHERN BELLE BEING SICK. SO "ROLLER-LESS" GOT PUT OUTSIDE SO THE D6 9U KNOWN AS "THE HOOD" COULD GO IN THE SHOP. 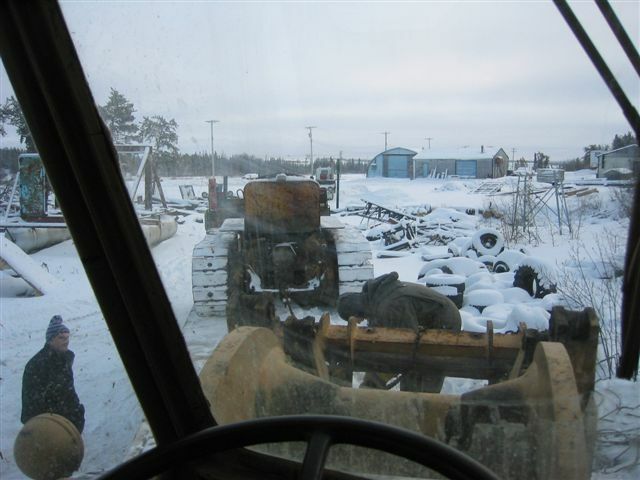 HERE IS A PICTURE OF "ROLLER-LESS" BEFORE I TARPED HIM"
I DRAGGED "ROLLER-LESS" OUT FROM THE CAR-PORT WITH MY 922 CATERPILLAR LOADER. A QUICK WASH WITH THE PRESSURE WASHER TO GET SOME OF THE GREASE AND OIL OFF. THEN IN MY LITTLE SHOP HE GOES SO I CAN START WORKING ON HIM.